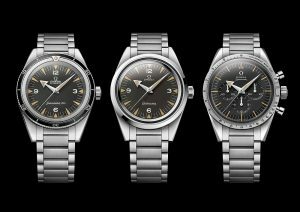 As I am sure many of you are I am watching the news of all the new watches coming from Basel this week. 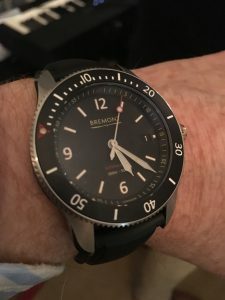 Now clearly this is not strictly relevant to this blog but there is something that is worth considering, a point I have discussed before that is the size of watch cases. I look forward to seeing how this trend, if it is a trend, develops. 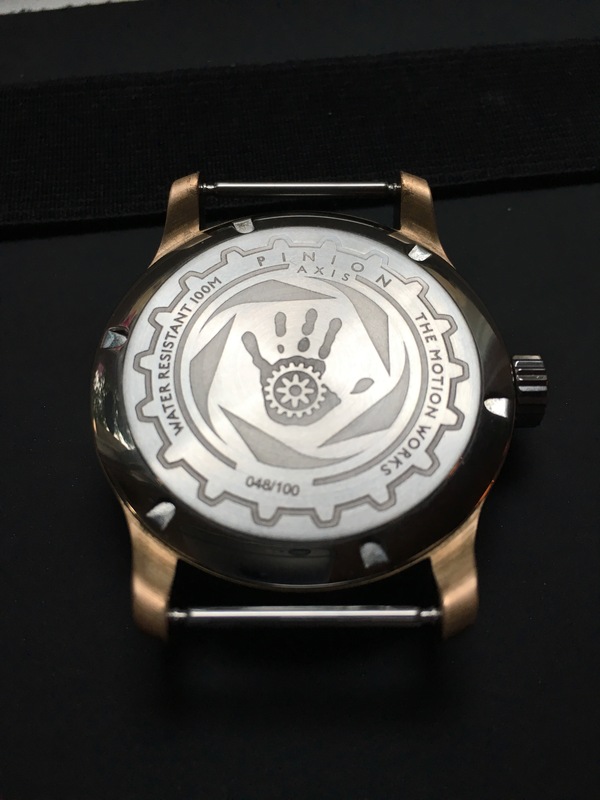 You might remember I wrote about this watch company at the end of 2015. 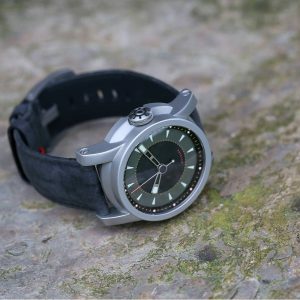 The story went on and as you will see from this article on the Microbrandwatchworld website suggests that it has not gone according to plan. 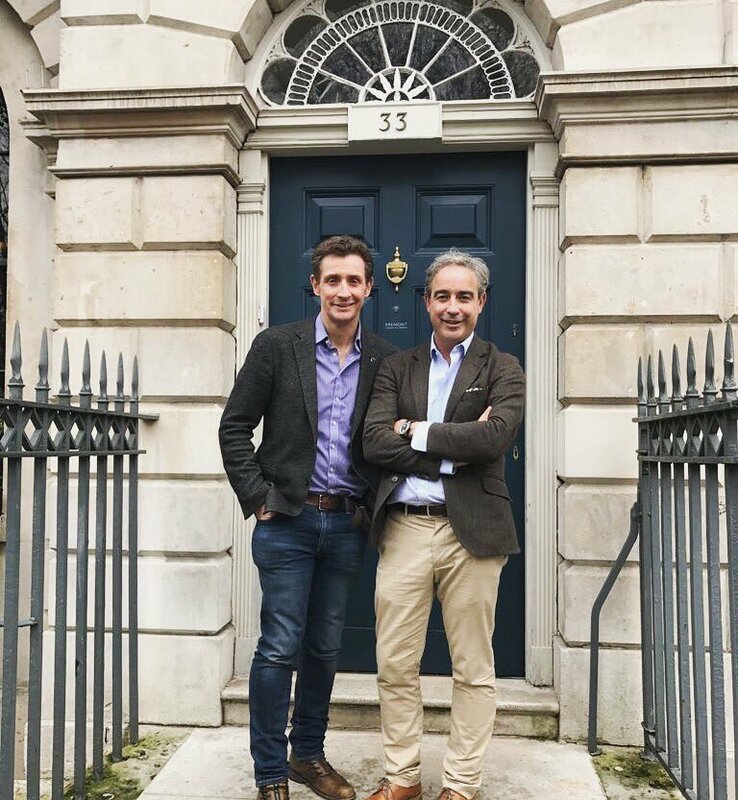 I have been meaning to join the regular monthly meetings of the Redbar group in London for sometime but for some reason or another I always had some other commitment. There was no excuse for missing this one . Firstly, it was a presentation of the 2017 range and secondly it was being held 10 minutes walk from my office. I am very pleased I “put myself out” it was a really enjoyable evening. Bremont had decided rather than attend the SIHH in Basel they would hold their own event in London, which considering the SIHH is a Swiss watch event seems entirely logical and probably a good bit cheaper. Before attending the event i had already seen quiet a lot of images of the new 2017 Bremont range – I was really looking forward to see the new 40mm S300/301 Supermarine range of diver’s watches. 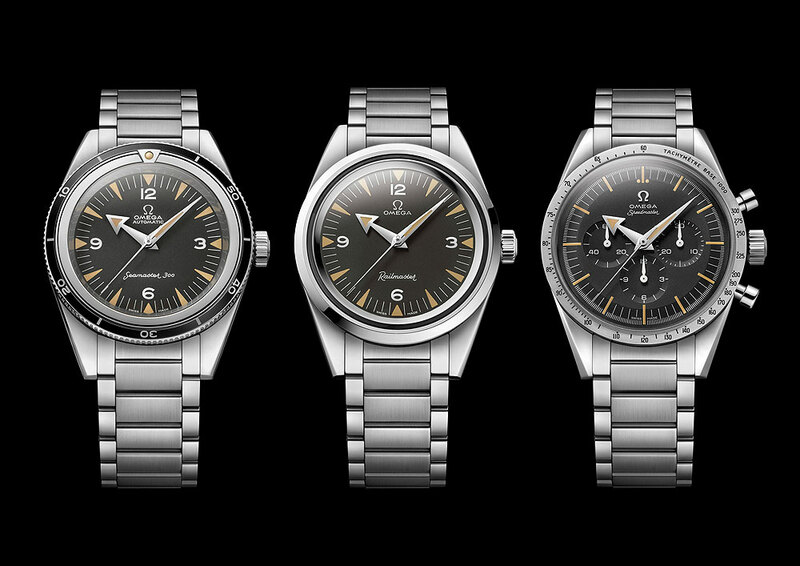 Firstly, because I like diver’s watches and because of their 40mm case size. I felt maybe my thoughts about a move to smaller cases might be proving correct. 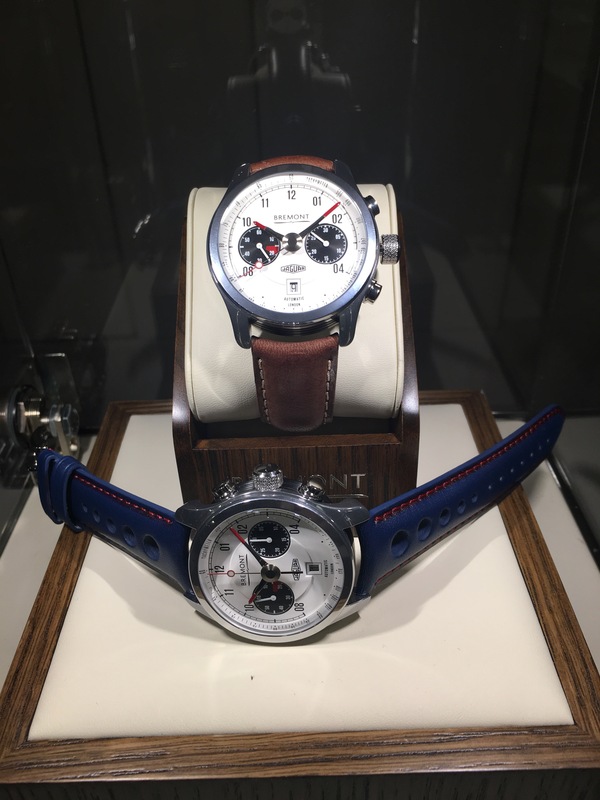 However on entering the event the first watches I saw were the new motoring related models made in collaboration with Jaguar and Norton. 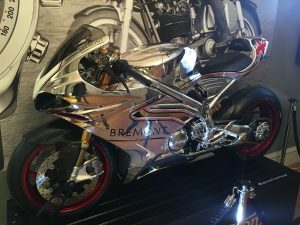 An additional non-horological item being the new Norton V4 motorcycle looking amazing. 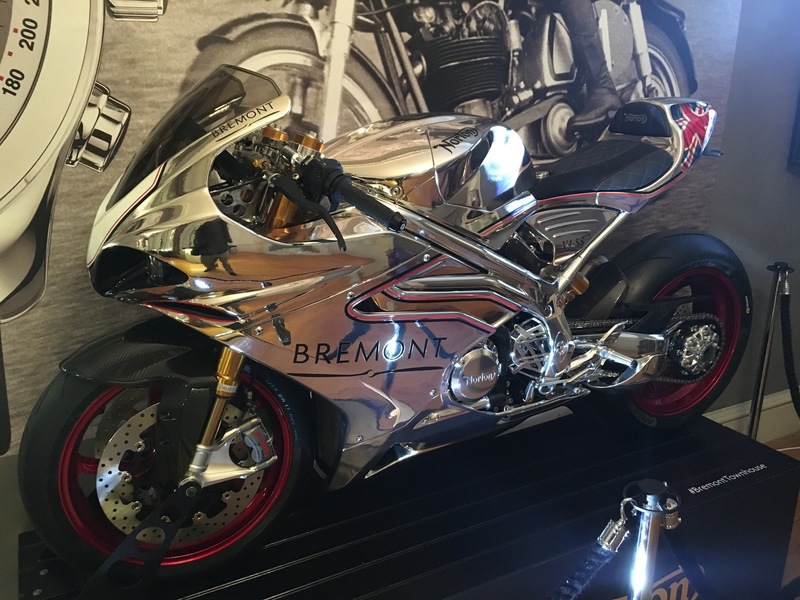 Bremont will be making 250 watches for owners of these limited edition bike. The main event was held on the next floor, which was were the new Supermarine and Airco ranges were on display. I had to wait a little time to get my opportunity to try the watches for myself. 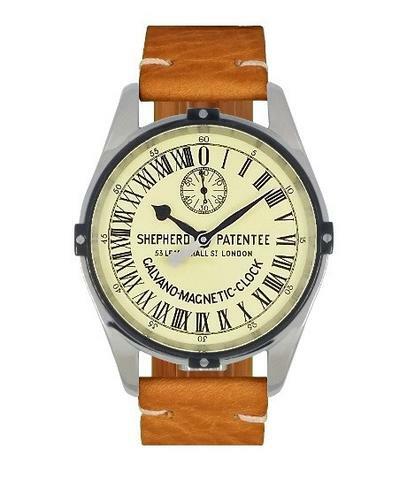 The Supermariner S300 on the leather strap was my favourite of the new collection, the perfect “wear all the time” watch. The size and weight is perfect, the date window is normal and it is rated to 300m. 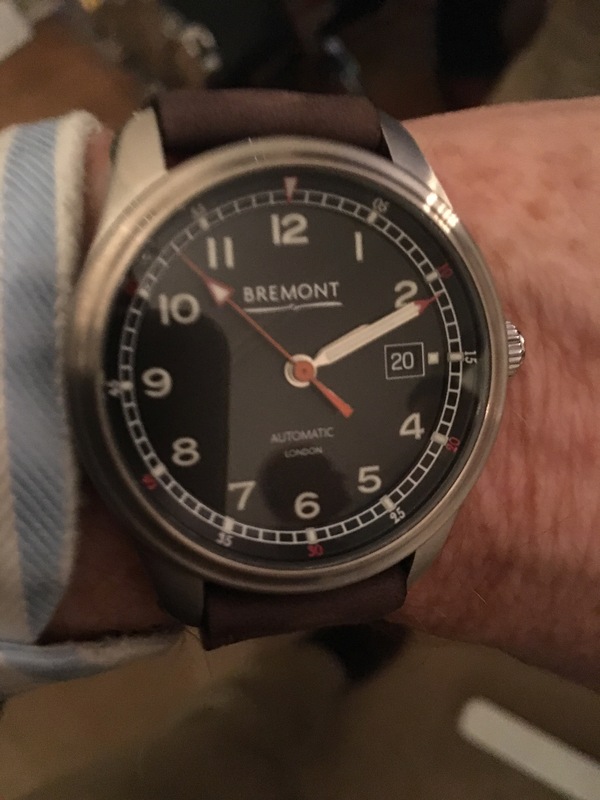 If I have a doubt it is that the design is pretty “classic” for the type of watch, I wonder if Bremont could have tried to make it more distinctive without loosing its appeal. The only difference I can spot between the S300 and the S301 is the use of the numbers 12,6 and 3 on the S300, the S301 relying on batons. Both watches are available on a steel bracelet, a Nato as well as the calf leather shown in the photo above. The new 40mm Airco range consisting of two watches, the Mach1 and the Mach 2. 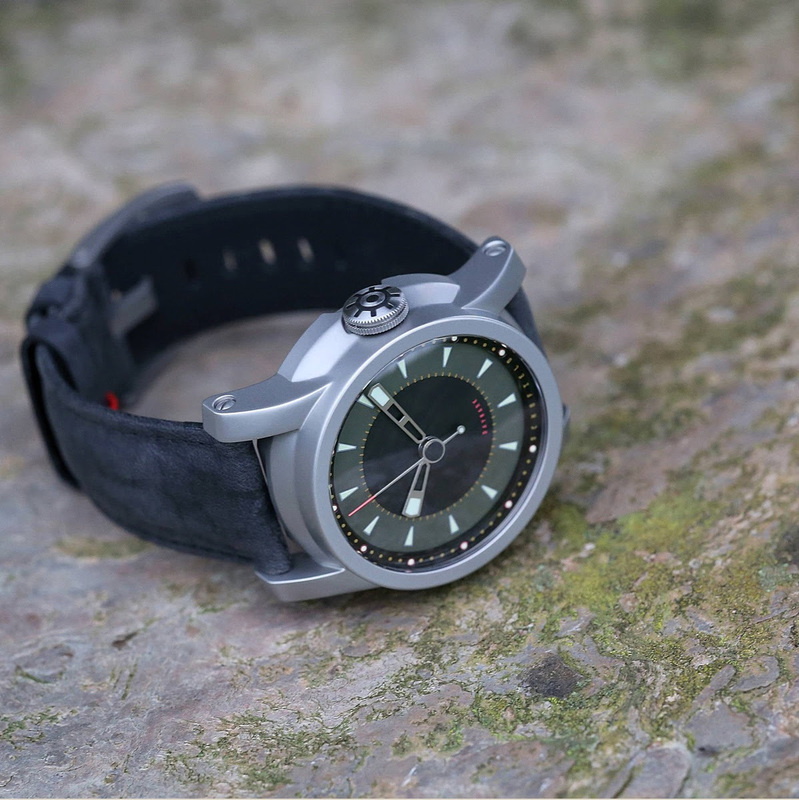 Both watches have straight forward three handed dial with a date. The difference being in the finish and the position of the date window. Like the S300/301 these are both very useful and comfortable do it all watches featuring the a 40mm version of Bremont’s Trip-Tick cases. The Mach 2 is proposed as the slightly more formal “officer’s watch”. 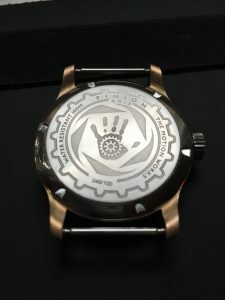 i hope to get a chance to have a closer look at both of these watches in the future. But apart from having a chance to chat to other watch enthusiasts openly about watches the highlight of the evening was a quick chat with Giles English, during which we managed to cover the challenges of producing these new 40mm watches and the currently difficulty for luxury watches, especially the larger Swiss brands. As always it is always a great pleasure to meet people that have followed their dream and launched their own watch brand. I have now broken the Redbar ice, I will definitely make more of an effort to attend future events. 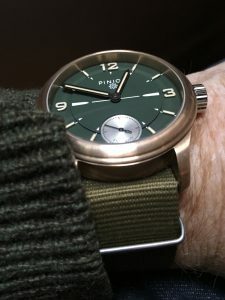 I have had my Bronze Pinion Axis Pure for just over two months now so I thought it was about time I publish my initial impressions. This watch, more than any other I have had, offers a very involving experience. This involvement starts every day with the morning ritual of winding the manual Unitas 6498 movement, which has a very satisfying dependable feel. I then usually put the watch to my ear just to hear the slow tock……tock. The day can now commence. 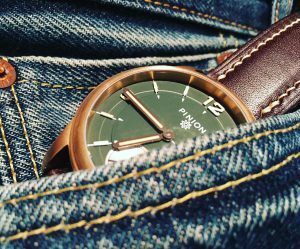 Every since my first meeting with Piers Berry, the founder of Pinion Watches, I have been fascinated by the idea of bronze cased watches. Piers was an early advocate of the material and would mention how if you google “bronze watch” Pinion came out top of the list. Piers has now decided the material has become a bit mainstream and is concentrating more on other materials and finishes. This may be, as he has told me, that customers attracted to the brand by the bronze models more often than not ended up buying steel watches. I am sure this is because when you way up the pros and cons of each material steel possibly results more versatile and less of a risk. By not taking the “risk” however I think you miss the opportunity to experience the changes, the development of patina. Each watch becomes more individual, more personal over time in the same way that selvedge denim does. 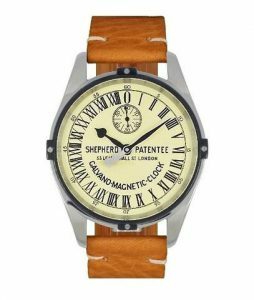 As well as the case “maturing” then there is the lovely English leather strap which is slowly becoming creased and more flexible adding its character to the mix. Leaving aside this development of character, the watch it self is very satisfying. I have been championing smaller, 38/40mm, case sizes so I was initially concerned that at 42mm I might find the Pure too big. But then I reasoned my Speedmaster is the same size and that sometimes even looks small. The Pure is not a “dress” watch but it does wear very easily. I have now got used to the size, and as it gets darker it is less “in your face”. One design element of Pinion bronze watches that I initially questioned was the steel crown. I thought a bronze crown would have been more appropriate. Piers has obviously been questioned on this point several times so just had a slightly cross look when I mentioned it. 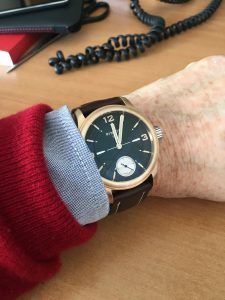 Now I must agree with the choice of material as it broadens the choice of straps you can choose from, there are not many many available with bronze fittings, especially good quality Nato’s. As my watch is one of the last of the bronze Pures, Piers had it made with the green dial which previously had featured only the the more recent gun metal cased watches. This adds further to its distinctiveness. Another feature I really like is the case back. I have never been a fan of display backs, they always have seemed out of place on the more robust style of watch I prefer. So, my conclusion for now is I am very happy with the watch. It has a distinctive non-generic look that however is not weird and has a character that is developing much in them same way as a pair of leather boots or raw denim jeans. I will give a further update in a couple of months.